The world's most powerful estimation and project intelligence software, powered by the largest database of its kind. QSM's Software Lifecycle Management (SLIM) tools are the gold standard in the industry and the top choice for over 37 years of Fortune 1000 corporations and governments across the globe. Drawing from a database of over 10,000 verified software projects (the largest database of its kind), our software enables better decision making at every stage of the project development life cycle—estimating, tracking, and metrics analysis. Each tool is designed to deliver powerful results, either as a standalone application or as part of QSM's integrated suite. Are spreadsheet estimates failing to deliver? Are you struggling to determine whether cost, schedule, and scope expectations are realistic or recipes for disaster? Are you having trouble aligning your "realistic" project or portfolio resource demand with fixed resource capacity? Then it’s time to graduate from clumsy spreadsheets to the industry’s best systems and software project estimation tool—QSM’s SLIM-Estimate®. With SLIM-Estimate, you’ll instantly know the cost, time, and effort required to satisfy any set of requirements, and the best strategies for designing and implementing your project. When projects veer off track or change in scope, can you easily forecast new schedules and budgets? Are you frustrated by cost and schedule overruns on projects your enterprise PPM system rated "low risk"? Do you need a better, more quantitative way to manage your outsourced vendor-developed projects? QSM’s SLIM-Control® helps your projects stay on course like a GPS navigation system does for your car. Using statistical process control techniques, SLIM-Control compares project plans against project actuals—then generates a forecast to completion. It offers both built-in and user-defined metrics, as well as earned value charting and reporting. Do you know how your teams are performing against their peers? Can you measure the benefits of new processes, methodologies or tools? Can you use historical performance trends to support new project planning initiatives? 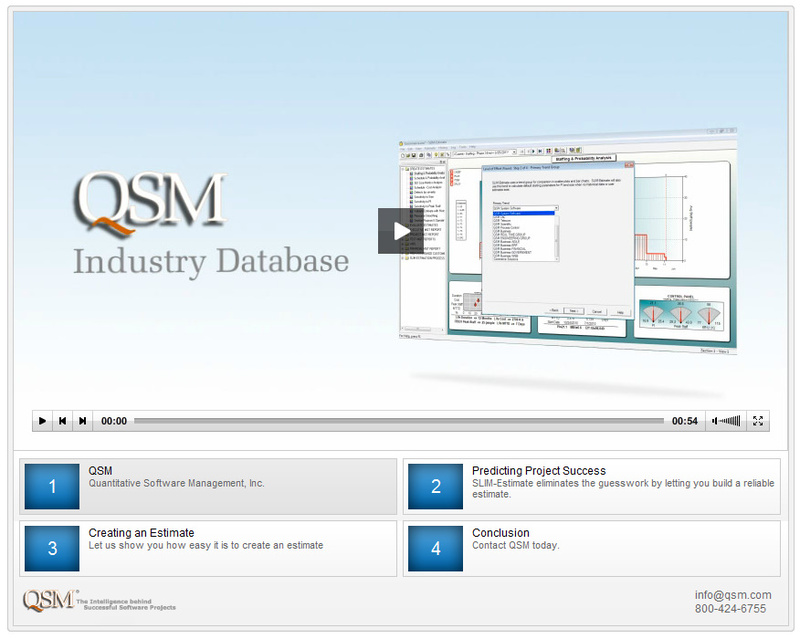 QSM’s SLIM-Metrics® helps with all your project performance baselining and benchmarking needs. SLIM-Metrics works with our SLIM-DataManager® data repository tool to help you preserve project histories, assess competitive positions, identify bottlenecks, quantify the benefits of process improvements, and defend future project estimates. Benchmark your data against industry reference trends from the QSM database of over 10,000 complete software projects—or create your own benchmark trends to use in SLIM-Metrics, SLIM-Estimate®, or SLIM-Control®. Are you still capturing project metrics in spreadsheets—with little ability to share data across the enterprise? Are different teams capturing different metrics, with no standardization? Can you add new metrics and scale your corporate repository as your analytical needs expand? QSM’s SLIM-DataManager® will meet all your enterprise data repository requirements. SLIM-DataManager is a robust data repository tool—included with the QSM SLIM Suite—that helps create a sharable corporate database of your completed projects. Once implemented, SLIM-DataManager works hand-in-hand with the full complement of SLIM tools to analyze your data, uncover key relationships and trends, and support fact-based estimation. Can you see the big picture on a multi-faceted project or portfolio of projects? Can you quickly determine how changing one project’s scope, staffing or productivity will impact the whole portfolio? Do you know if your current resource capacity can support tomorrow’s pipeline of demand? SLIM-MasterPlan®—working in concert with the full SLIM Suite—provides a comprehensive solution to these and other challenges. SLIM-MasterPlan is ideal for analyzing organizational portfolios and planning large complex system integrations. In fact, using its global "what-if simulator," you can easily analyze multiple projects with complex interrelationships, and quickly assess alternatives. Is a software proposal destined to fail? Are a vendor’s assumptions unrealistic? Will adding more programmers help or hurt? These questions are crucial for determining the feasibility of any project. But for non-technical business stakeholders, getting the answers can be a daunting task. That’s why SLIM-Collaborate® offers everyone in your enterprise instant Web access to the information that matters most. SLIM-Estimate improves efficiency of estimation group and enables customer to save time and money. Major system integrator improves the accuracy of their estimates by calibrating SLIM-Estimate to their own historical data. Director of Engineering for a major software engineering firm uses SLIM-Estimate to negotiate smaller staff, saves time and money. A major telecommunications equipment supplier uses the SLIM-Suite to formalize their estimation process across multiple teams and ultimately deliver a $150 million system on time while meeting reliability goals and yielding an acceptable profit. QSM client uses SLIM-Estimate in an oversight role to uncover an unrealistic proposal and then select a vendor that had a good technical solution along with an effective execution plan. This demo gives you an overview of QSM's SLIM-Estimate tool, as well as an introduction to the SLIM Suite of Tools and the QSM Database. Let us show you how easy it is to generate reliable estimates validated by completed project data from the QSM Industry Database or your own history! Connect with a QSM representative to get a customized demonstration of our tools and services. Let our consultants do the legwork for you. Learn more about QSM consulting.